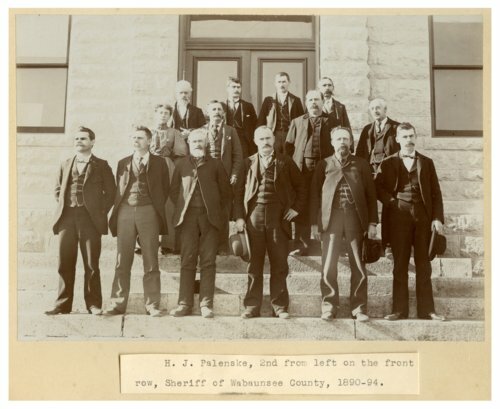 Photograph of county officials standing on the courthouse steps in Alma, Kansas. Herman J. Palenske, second from left in the front row, served as Wabaunsee County Sheriff from 1890-1894. Willis G. Weaver, clerk of the District Court of Wabaunsee County, Jerry B. Fields, treasurer of Wabaunsee County, and Theodore S. Spielman, probate judge of Wabaunsee County, are also present in the photograph.